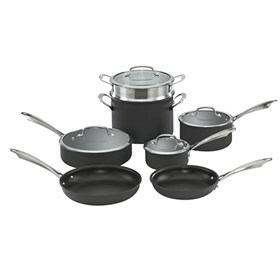 The Cuisinart DSA-11 is a 11-piece hard-anodized cookware set to decorate the kitchen. This Set features ArmorGuard™ Technology which gives a rich hard-anodized exterior and ideal construction for superior durability with optimal cooking performance. It comes with ergonomic handles which stay cool on the stove-top. The Ds Hard Anodized 11 Pc. Set Dishwasher Safe Ha Cookware Set has many exciting features for users of all types. You can extend the lifetime of your Ds Hard Anodized 11 Pc. Set Dishwasher Safe Ha Cookware Set with the purchase of a FactoryOutletStore Factory Protection Plan. The Ds Hard Anodized 11 Pc. Set Dishwasher Safe Ha Cookware Set is sold as a Brand New Unopened Item.